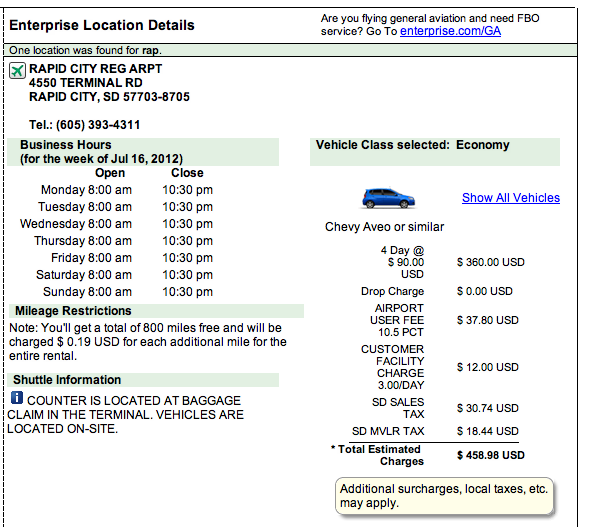 Enterprise Rent-a-Car “We’ll Pick You UP”… just not at an airport! In the words of Earl Pitts… “Ya’ Know what make me sick?” – Getting screwed by a rental car company! While planning our trip to Oshkosh by way of Rapid City, SD (KRAP), I figured we needed a car for the four days we planned to be in KRAP. So I called the FBO at KRAP and asked about rental cars. The response was that we can get you a car from Hertz and have it here when you arrive or you can get one directly from Hertz. 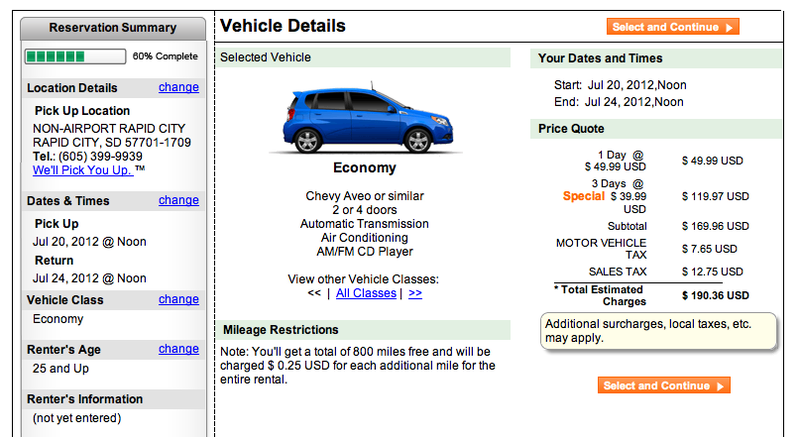 So, I decided to go online with Hertz to see what their rates were and if maybe there was another option. Sure enough, Hertz had a rate for the FBO delivery… $90 per day plus a multitude of taxes that amounted to a total over $450 for four days! HOLY KRAP! What a racket… So much for their popular “pick you up” slogan. I understand that there may be some additional cost of doing business at the airport, but to be able to charge 141% more for the same car – I gotta call blowing snow here. So, I guess we will figure out a way to get into town, I’m sure I can get a cab to take me in for 20 bucks or so, which will still keep our rental cost below $250, that $200 saved will buy a lot of Leinenkugel’s when we get to Wisconsin! FAST FORWARD 24 HOURS… After stewing over this CRAP @ KRAP, I got to thinking that maybe there was a local alternative to the national rent-a-car companies and the whole airport price fixing thing and after a quick Google search, I found several local companies that WOULD pick you up at the airport. I ended up calling Black Hills Car Rentals and talked to John, who said he would pick us up at the FBO for no extra charge and the rate was $37.95 / day plus tax! For a total of $193, we can be picked up at the FBO when we arrive and can leave the car at the FBO when we get ready to depart… now that’s customer service! So, I quickly cancelled the Enterprise contract and I will post our experience with the local company after we return the car, but I am confident, at this point, it will be a good one. 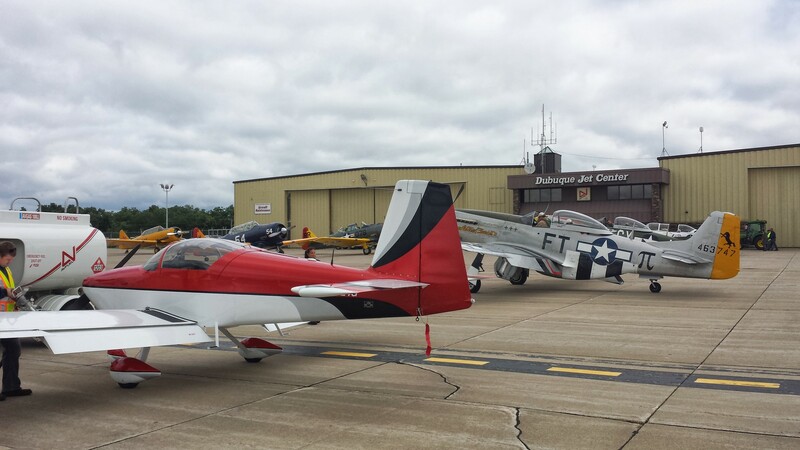 It’s only a matter of time… before one of these UAV’s comes into contact with another airplane. Don’t get me wrong, I’m as big of a “technologist” as anyone, but the level of technology required to keep these things separated from “the rest of us” is NOT THERE YET! Most of the UAV’s of the world are piloted by a guy in a mountain cave in Colorada in front of a computer screen with a joystick. Some, are flown locally from an inconspicuous trailer in the Walmart parking lot, but they all require a radio signal to the UAV via a satellite data link… that is where the problem starts! The system latency of a long distance, point to point satellite signal can be several seconds AT BEST… imagine a 400 MPH vehicle being controlled by someone who only knows where it was 3 or 4 seconds ago. Skin in the game… When we are flying the RV-9A around, we are always looking for other planes, even if we are on an instrument flight plan. The most basic rule of flying is “see and avoid”… I don’t think this can be done as effectively from a cushy seat in the Colorado “bat cave”… what does he have to lose? If the drone, Captain America is “flying”, “scrapes paint” with my little plane or God forbid a 737 with 184 souls on board, he goes home a little upset and the rest of us get shipped back in a pine box! LANDED – WTF?? ?… Details of todays incident in Maryland can be found at this link on USA Today. You gotta love the mainstream media’s view of what happened. Look about 2/3 of the way down and see the quote “CNN says the drone landed in a marshy area near Salisbury Md.”…. LANDED!! !, I was always taught that a great landing was one you could walk away from and a good landing was one that you could still fly the plane after. Apparently, CNN thinks that any drone in a SMOKING HOLE has landed! Time and a Place… Don’t get me wrong – I think these things have a place “in theater” during war time and “off shore” for for testing. But, PLEASE don’t put me face-to-face with this 176 Million dollar RC plane operated by Captain America until his seat is rigged with a little C-4 plastic explosive that is set to go off when we make contact!